Glassy, supple and extremely robust, cordovan numbers among the most coveted types of leather in the world, and is used to make the crème de la crème of men’s shoes today. Its good reputation is rooted in its special qualities: shoe lovers rejoice in its long lifespan, unique patina, and wearing comfort. All of these attributes result from the naturally high proportion of fat in cordovan leather, which also guarantees the leather’s high elasticity and gleaming suppleness. 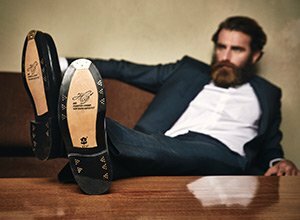 Robust cordovan leather shoes form fewer creases than do other models. The care process for this luxury leather is quite simple: first and foremost, refrain from applying classic shoe creams. Since cordovan leather is naturally high in fat, these creams oversaturate the upper and cannot be polished away. Burgol’s cordovan shoe polish, on the other hand, is perfectly tailored to the needs of this equine leather. Use a traditional shoe bone to easily massage small scratches and creases out of the leather. Equally indispensable: a soft polishing brush for the final polish. 1 Cordovan Shoe Polish in bordeaux or black. This Burgol shoe polish has been specially tailored to the needs of cordovan leather. Provides intense care and creates a high shine. Contains nurturing oils, waxes, and natural colourants. Available in six different shades, corresponding to the most popular cordovan leather colours. 1 Shoe Bone. The classic tool for cordovan shoes: a shoe bone that contains its own oils, taken from the foreleg of the fallow deer. Simply massage it into oil-treated cordovan to effortlessly remove scratches and creases from the leather. 1 Yak Hair Brush – dark. This silky-soft yak hair polishing brush has been specially created to provide premium shoes with a final polish. Bristles made from the thick, curved hair of the Tibetan Highland yak guarantee fabulous shine. This extremely long-lasting brush is made by hand in Germany and features a beech handle. 1 Shoe Cleaner – 125 ml. Gently removes soiling, salt and perspiration stains from smooth and rough leather shoes. This cleaner restores shoes to their natural pH balance and does not contain any surfactants. Purchasing this cordovan shoe polish kit saves you about 14%, as compared to individually purchasing each item contained inside.